Does this apply to only those EEA) readers who have opted out of cookies and other forms of data sharing. I was not sure if I should have agreed to only necessary or ticked all the boxes earlier? What did others do? Yes, this only applies to readers who have opted out. Thanks, Christy, how do I change my decision, please? You can opt back in with the consent dialog tool, which can be found toward the bottom of this section. Is there anything else the world is going to come up with to cut into our views and income? My views dropped by 1,000 today...is this the reason? if so, oh goody! My UK traffic dropped by half, plus there are rumours of a search algorithm update yesterday (24th). I think you should say, my UK traffic stats dropped by half. Not necessarily an actual drop. Impressions should give a rough indication of views then? Presumably a percentage of readers who land on a site will back out when they get presented with the cookie acceptance popup. Privacy has definitely become a big issue, especially in Europe. It's unfortunate that this affects our income from publishing articles, but thanks for keeping us informed. My views are a little higher than usual. Amazon has been doing well. I foresee this month of my highest ever earning-wise. It's always a bit of a rollercoaster, but I smile a little when checking the numbers. I understand the rollercoaster ride...but a 1000 drop in views in 24 hours is a bit much. I was just wondering if this new stuff is the reason or if it's just a bad day. Amazon is doing pretty well this month, but Adsense has almost totally tanked. One thousand views means different things to different people, depending on how many views they usually get. If you normally get 20,000 views per day it is a 5% drop, if you normaly get 1,000 views a day it is 100%. My traffic dropped by 20% since yesterday. It's the lowest it has been in over a year with twice as many articles. Not good. Same here, the worst stats for years over the past few weeks. Not good at all. Thanks for keeping us informed Christy. So far HP is the only website that has offered me the option to choose what I share etc. I've been getting loads of emails and post from my bank and other organisations asking for permission to be able to contact me in the future. I for one definitely need the time to read through those guidelines. On my own website I just and blocked all traffic from Europe until I get the time to deal with this. As a Google Blogger, should I do something? I am thinking that all these updates are only for Ad Publishers. So, Google will handle it on its own as I am using their platform. Yup, Blogger should handle this themselves, I believe. In reply to eubug, Natalie and Sallybea. Find out if your US traffic is down too or just the European traffic. If it is just the European traffic it is because most people are choosing the option where they do not allow the analytics code to be on the page. So there is no way to track them. The same with impressions and as Christy pointed out in the original post they will look into non-targetted ads for these users. Regarding the fact that some people will back out. In Europe all websites of any quality show this message or pop-up. So most people are going to accept cookies and choose not to be tracked. Therefore, I do not think many people are going to be backing out because of this. Just checked and since the 24th, my UK daily views have fallen from 1500 to 300. US traffic was constant and unchanged. Is it just since 24th May or, it is a gradual fall since more than one month? Because my blogger traffic fell since more than one month by 20%. No, it was rising, but I think the rumored algorithm update on the 24th may have contributed to a drop in views also. If it was the algorithm I would think that your US traffic would also be affected. Well yes of course that's true, although at least one hub gets traffic almost entirely from the UK. It would be interesting to know what the stats are on the percentage of readers to niche sites who didn't tick the tracking check box (that's if this data was logged). Technically this data should not be logged as this entire thing is to prevent the collection of data without the users consent. It would be fine to log it as long as information that could identify individuals isn't logged at the same time. Would definitely be interesting to know what the stats are. My views seem about the same and a lot of my traffic is from the UK. But if you read the hp terms analytics is one of the things that needs to be approved by the user too. Thanks. Looks like it's the European traffic much more than the U.S. traffic. My UK percentage drop is only 1% over the last week and overall for the last month. Most of my traffic comes from the USA and Canada so I don't think the loss is due to this. Perhaps it is the fact that I have not written a new hub for a couple of months! Currently, I have stitches on one of my fingers due to an injury so can't do any felting at the moment. Just checked impressions for Friday and they're down 25% compared to previous Fridays, even though views were rising all week. Will the stats on each hub show visits from the EU as being from an unknown country, for users that don't accept tracking cookies? Good question for the staff. A lot of my readers are from the UK. I'm not sure what to do. There is nothing you can do, to be honest. So don't focus too much on that, it's not going to get you anywhere. Hopefully one day there will be a non-personalised ad campaign running here. They will show up in the HP stats the same as they do now. ...so untracked readers will just be absent from the stats? European readers will still show as being from Europe on the HubPages stats. The ones who opt out just won't show up on Google Analytics. How do I find a step-by-step guide on what needs to be done and how. I’m really lost on this GDPR issue. If you are writing on Hubpages you do not have to do anything, other than write. Thank you. But for those of us who have websites, what should we be doing about it? I’m totally lost! So it seems there are no ads whatsoever shown to readers in the EEA who don't accept the checked boxes for tracking cookies? I thought it was just that targeted ads based on location were not shown? Read the original post. Christy did say this. She also says that they will look into non-personalised ads. Where does the 2% to 3% decline in earnings estimate come from? 20% of my page views are from the UK. Is it based on a site average and/or lower revenue from ads targeted at non US readers? Yes, CPM tends to be lower for European traffic, so while we expect a 5%-6% decline in readers who see ads, this should translate to only about a 2%-3% decline in revenue. Ok, thanks for clarifying that Christy. Yup, they are definitely HP averages (all niche sites). And as Christy says, EU traffic typically has lower CPMs. Is there any progress on non-targeted ads? What is the position regarding the Amazon ads that I have put up on my articles here vis-a-vis the GPDR issue? Can anyone clarify this please? Thanks! No issue with the Amazon ads. Is it possible to differentiate between European readers who don't want to be tracked and the rest? If so, why not just show them UK ads rather than nothing at all, considering most of the European readers will be from the UK? If it's not possible to differentiate between EU readers who don't want to be tracked and US readers who don't want to be tracked, I don't see how showing UK ads, which could be seen by US readers is any different from UK readers visiting the site and seeing Amazon.com ads. I think I'm missing something here? ....or is it the case that HubPages has no control over the country specifics of ads and can only show non targeted types? Just made a scathing Facebook post about all this. No doubt a waste of time, but I did it anyway. Basically; since when are US citizens, while in the US, subject to Europe's laws? How are they subject to Europe's Laws? But the new setup only applies to readers in the EEA accessing the US site? US citizens aren't asked whether or not they want to accept cookies? Europe is ordering US-based sites to comply with European laws. As far as I'm concerned, US sites only have to obey US laws. If North Korea said our websites had to obey North Korean laws, we'd tell them to drop dead. What I don't understand is why our government isn't telling Europe the same thing. It's to safeguard the privacy and protection of data of individuals in the EU. It is pertinent to the US (and all other countries) because US sites collect that data. They want our business, our visits, clicks, purchase power etc. In return these sites and companies must agree to take care of that data. Fair exchange? US businesses who don't want to make the necessary changes can disable their sites to European visitors, and some have done so. Others prefer to keep the channels open so have to comply with the EU requirement. If a US business uses a server on European soil for mirror site purposes and so forth, then you are right. But if a site is strictly located in a single country, then it should only be required to obey the laws of that country. No, it's because they collect personal data. That data belongs to the person, not the company. If the person agrees to them collecting data and placing cookies on our browsers, then that's fine. But we have to be asked. After what Facebook has done, it's pretty obvious that this requirement should be universal. Isn't it similar to exporting a product to another country. The product must comply with the country's standards? We are not exporting a product. The EU consumer is going to the US to obtain that product. If the product is illegal in the EU, that is between the EU consumer and their government. The EU consumer goes to the US to request the product. But the product is then sent out to the EU consumer? (the HTML code that is). It's got nothing whatsoever to do with selling people products and everything to do with keeping their personal data safe from whatever devices are used to collect that personal data. I know that. I was using products as an analogy. The word xenophobe does come to mind. @theraggededge and eugbug, good convo! There are some very serious misunderstandings about what GDPR is about in this thread. Also you may lose traffic to people who start to refuse Google Analytics trackers - but probably not as many as you lose to those who have Ad Blockers on - and the increasing numbers of those who choose to use Ad Blockers in the face of what they see overall (i.e. this is not just about HubPages) as increasingly intrusive adverts. Bottom line if you want to be online, you need to understand some of the basic ways in which you have to obey the rules (to avoid fines) and monitor the changing ways people behave (if you want to make money). I kind of miss the old days before Web 2.0... it was like the wild west. Angelfire and Dmoz and Alta Vista . Meanwhile, the State of California has now gotten into the act re: internet privacy. I'd provide a link, but they're all paywalls or otherwise obnoxious. If interested, do news search for "California internet privacy". They passed the new laws yesterday, goes into effect Jan 1, 2020. Update. Can't edit our posts under the new forum design yet. Just wanted to add that what California did has national implications. The bad news. No way I could do all the website redesign and coding demanded by Europe. The good news. HubPages, AdSense, Blogger took care of it for me. I pity all the mom and pop websites out there who are stuck with thousands of dollars in programmer bills. For that matter; I wonder how much time, money, labor Europe's God Complex has cost HubPages. And I'm still wondering why our government hasn't told Europe to take a hike. If US companies want EEA citizens to use their services then they need to try to comply or they will lose business, regardless of what the US government says or doesn't. As an EU citizen I am glad that Hubpages has taken steps to comply, otherwise I might have to think twice about continuing to write here for example. I get where you are coming from. But I think there is a lot of misinformation and panic around- it seems unlikely random small "mom and pop websites will have action taken against them. It's more about going after Google, Facebook etc, and stopping companies being able to stalk people using the internet without them knowing. As long as Europe only occupies itself with businesses who have a physical presence in Europe, I neither object nor see any problems. It's always been that way. But if Europe takes action against some small, personal website that's minding its own business; then it probably will hit the fan. Personally, I wish Blogger would give us the option to block all non US traffic. That would solve the continual Russia/China hacking problems and the Europe bureaucracy problems all in one shot. You are still missing the point that it's about the handling of personal data and tracking. It's got nothing to do with physical locations of businesses. If the small, personal website is not collecting personal data then there's no problem. This is not just about visitors to a site either, it's about making sure the website owner has covered his own ar$e in the event of having his site hacked and personal data like customer payment details stolen. Data breaches are huge deals these days. Anyway, it makes no difference whether you object or not. It exists. What exactly is going to hit the fan? Why would you think objecting to this makes a difference? However the website that attracts and collects/harvests personal data from European residents and then sells it or is insecure enough to allow it to be harvested by others is going to be vulnerable to fine upto 4% of their business turnover (i.e. turnover NOT profit). Small wonder that Google and Amazon and others with mega profits made sure they were compliant PDQ! Bottom line, countries won't allow ANYBODY to be lax about personal data any more. As an analogy, I would liken GDPR enforcement for small website owners generating traffic (and personal data) from Europe to be rather like the small website owner who does rip-offs of Disney characters - right up to the point where they find themselves in Court facing a rather large lawsuit for recovery of all income derived from copyright infringement. Rules are rules - object all you like but you ignore them at your peril. BTW you can block traffic from specific countries. You just need to know how and then apply the code to your template. We will probably start seeing versions of the above here and there. A lot cheaper than the thousands of dollars in programming costs that the EU demands. Isolationism might feel good for a while. However the fact that organisations like Harley Davidson actually think that following where the customers are is rather a good idea might give some cause for reflection. - even if they did come around to the notion that world trade is quite a good idea and got their website sorted. For example, I now know which newspapers are careful about security of personal data and which are not. I also now know which newspapers to avoid in future. A. There are European websites that have already been doing this to US users for years. B. Needless to say; websites banning users from specific jurisdictions will and have done it in a lot nicer way than that meme. Btw, it is only a matter of time before the US government comes up with its own set of obnoxious website-programming laws. 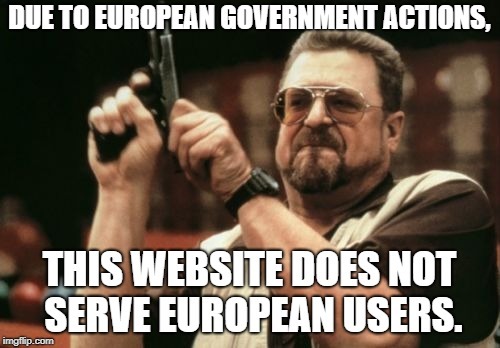 Thanks to Europe, most websites will already be in compliance.